Hello, fellow authors and book worms! You know those books…the reads that give you goosebumps, make you cry, laugh…and fall into the depths of despair, only to be lifted up on a huge high when you read the final page? 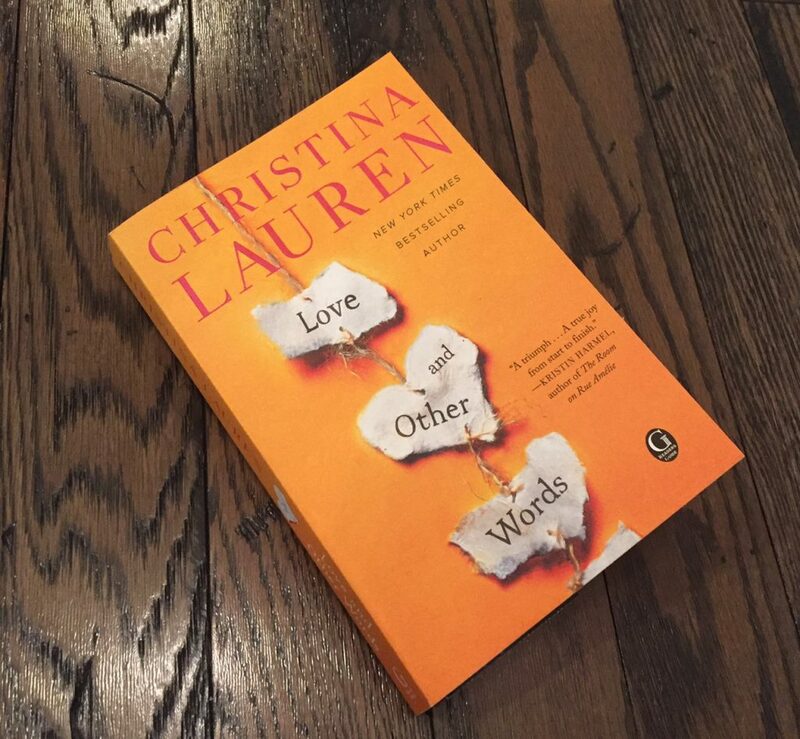 Oh, my goodness, that was me with LOVE AND OTHER WORDS, the latest bestselling release by Christina Lauren. I was so caught up in Macy and Elliot that I was reeling by the end (in a good way) and had to jump back in and read it all over again—it was that freakin’ AMAZING! It has vaulted to the top of my ‘fave books of 2018’ list, and I think it might be one of your favourites, too! PLEASE WELCOME CHRISTINA HOBBS and LAUREN BILLINGS — CHRISTINA LAUREN! LOVE AND OTHER WORDS is the story of Elliot and Macy, who met when they were young teenagers after the death of Macy’s mother. Macy’s father had purchased a weekend home in the wine country of northern California to have a retreat for both he and Macy from their busy weekday lives in Berkeley. Elliot lives in the house next door to this weekend home; he and Macy become close on their weekends and during the summer. Over time, their relationship grows from friendship to more—they seem to have been made for each other. The book begins when they are both in their late twenties and haven’t seen each other in eleven years. It’s told in alternating timelines to reveal what happened eleven years ago, and in the Now sections, shows how their connection is still there and asks the question whether or not they can come back together and make it work for good. JM: What inspired you to write Macy and Elliot’s story in LOVE AND OTHER WORDS? CL: We started writing Macy and Elliot six or seven years ago with plans to make it into a YA novel, but the ideas and conflict weren’t completely outlined, so we shelved it when other things sold and became priority. When we came back to it a few years ago, we were able to see it in an entirely different way, and the idea was born for their young adulthood of exploration and intimacy, juxtaposed with their new adulthood of estrangement and, eventually, coming back together. JM: LOVE AND OTHER WORDS is a celebration of first love, friends becoming lovers, and second chances. I was completely smitten by both the teenage and adult Macy and Elliot relationships. In your opinion, what is it about second chance love stories that captivate readers so much? CL: Thank you! We’ve all experienced loss—whether it’s great or small—and can relate not only to the ways that Macy may want to continually protect her heart, but also to the way she has never felt for anyone the way she feels for Elliot. Those two things present a constant struggle for her, and give the book it’s forward momentum that we, as readers ourselves, love. JM: One of the most heartbreaking aspects of LOVE AND OTHER WORDS for me was young Macy’s grief over the recent death of her mother. Loss is a major theme of the book, but you handle it so perfectly. You’ve spoken before about your preference for a happy ever after but with women fiction (which is the genre for L&OW), HEAs aren’t guaranteed. How important was it for you to have a HEA? The story could’ve been quite different if it veered the other way. CL: We are romance writers first and foremost. We write love stories because that’s what we love. And in fact, we never really intended for LOVE AND OTHER WORDS to be a WF. We wrote a Christina Lauren book, with all of the kissing and swoon—and yes, a bit more angst—but always the HEA. As it turned out, when we turned it in, a lot of people within Simon and Schuster read it and loved it internally, and our publisher believed it had a wider mainstream appeal. JM: Is there a message you would like readers to take away after reading LOVE AND OTHER WORDS? CL: Don’t be afraid to talk about the things that scare you—especially with the people you love. JM: Let’s touch upon writing and how you go about creating addictive stories like L&OW. I think it says a lot about your talent to have a consistent single writing voice when the words are coming from the two of you! How do you write together (especially when you live in different states)? Do you split chapters, now/then storylines, or POVs? CL: Our process has had to be flexible over the years—these days we have more than one thing going on at once—but for the most part we outline in person, divide by POV, chapter or scene, write those sections, switch, and then edit edit edit and then edit some more! JM: Do you plot out all the twists and turns early in the writing process, or do they just happen as you go along? CL: We always have an outline because there are two of us, but we’ve learned to let the end be a bit more flexible. That way we’re going where the story leads, and not trying to manipulate things to fit where we thought it should go. That said, with L&OW we had to know what we were leading to in the end so that we could frame it and pace it correctly throughout. CL: It depends! Sometimes it’s the circumstance that grabs us first, sometimes its one of the characters. One idea happened while we were in Paris. It was our first international trip together and we stopped into a shop to buy each other a present. The woman who helped us was from California. When we asked her how in the world she ended up working at a boutique in Paris she said that she had married a Frenchman and when he had to go back to France, she went along with him. She leaned in and whispered, “I think there’s a book in there.” We spent that night at a little coffee shop outlining what would eventually become Sweet Filthy Boy! JM: You met writing fan fiction. What fandoms give you all the feels? CL: We first met in the Twilight fandom, but honestly we’re fangirls through and through and go wherever our hearts take us! Buffy, Harry Potter, Alias, Hunger Games—you name it! JM: You’ve written both series and standalones. When readers like me come along and BEG for more Carter and Evie, Calvin and Holland, or Macy and Elliot from your popular standalones, do you ever consider writing a sequel or novella? CL: There are several characters we’d like to revisit, but it’s hard to know for sure whether we will. Sometimes people think they want more of a particular couple, but often that means that they just want to be able to live with them in their HEA a bit longer (as romance readers ourselves, we totally get this, by the way!). If we wrote a sequel to Love & Other Words, for example, we’d have to infuse conflict, and readers likely wouldn’t want to see Macy and Elliot struggling again. Likewise, a book that is essentially about two people being very sweet and respectful to each other forever and ever isn’t all that compelling. BUT!! In our minds this is exactly what fan fiction is for, and we encourage all our readers to take the worlds we’ve created and add on and expand and write what they want to see. JM: LOVE AND OTHER WORDS gave me a major book hangover. I thought about it for days and the only way I could cope was to re-read the book—I just didn’t want to let Macy and Elliot go! Do you have favourite novels or movies that have stayed with you? CL: Of course! Sarah J Maas’s ACOTAR series, Tabitha Suzuma’s FORBIDDEN, Sally Thorne’s THE HATING GAME, Jandy Nelson’s books THE SKY IS EVERYWHERE and I’LL GIVE YOU THE SUN. 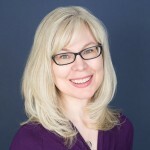 JM: Do you have advice for aspiring writers? CL: Read widely and voraciously. Sit down and write first, edit later. CL: We just finished copy edits on JOSH AND HAZEL’S GUIDE TO NOT DATING (Sept 4) and WE LOVE IT SO MUCH! If you were a Will and Hanna fan, this book is for you. We’ll be doing edits soon on MY FAVORITE HALF-NIGHT STAND (Dec 4), another untitled romance out in Spring 2019. We are drafting another WF and a silly romcom, and writing the ROOMIES movie script! JM: I’m copying the wonderful Elliot with my final question—what’s your favourite word? 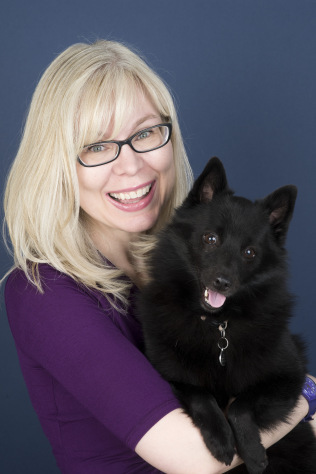 Thank you Christina Lauren for being guests in my Authors Celebrating Authors feature! 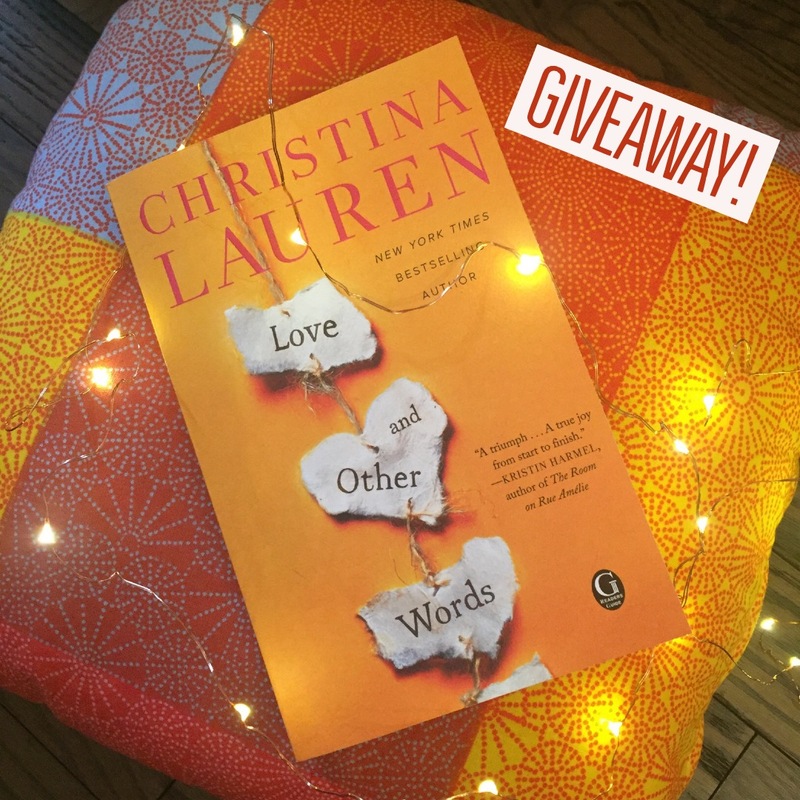 Want to purchase LOVE AND OTHER WORDS? It’s available from all major retailers including Amazon, Barnes and Noble, and Indigo. You can also follow Christina Lauren on social media. Follow her on Twitter, Facebook, and Instagram, and visit her website to discover her latest news, and read more about her brilliant books. ****GIVEAWAY NOW CLOSED****WINNER CHOSEN AND CONTACTED! Entries will be accepted here in my blog’s comments until Friday, May 25/18 at 12 noon ET. Winner will be contacted by email and will have 24 hours to confirm their mailing address. I’m not responsible for prize packages lost in the mail. (countries eligible for this giveaway are determined by the PR company/publisher, not Christina Lauren, or myself). My favorite word is tenacious. I love the meaning, stubbornly unyielding. Plus, it just rolls of the tongue when you say it! Mine would have to be either tranquility or preposterous! My favorite word is stupendous!! I’ve always loved ‘discombobulated’ for some reason. And also, I love this question! My favorite word is tomorrow. Inspired by my fav musical, Annie! There’s always tomorrow and that means that there is ALWAYS something to look forward too! Ever since watching Anne of Green Gables, my favourite word has been Zephyr — a soft gentle breeze. Secondary pick, thanks to Brigadoon, is Gloaming –the moment between day and night, similar to twlight.